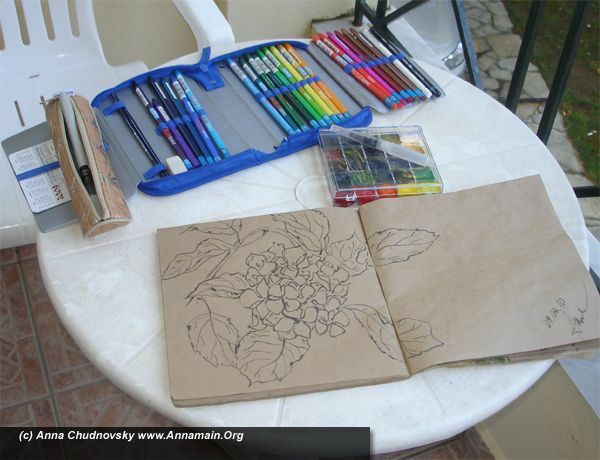 Hello everybody, today for my on-line school I`ve prepared the lesson about flowers. It`s the best subject to remember holydays (that picture I made in Liapades, Corfu, July 2010) and to make something like therapy by colors. The first step is to have a glance to real flowers. As you have a pleasure feeling about it it will be the best base to feel the same during drawing. 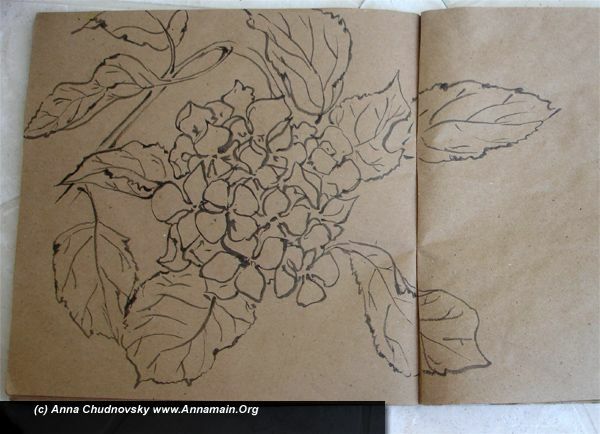 This is the hydrangea I drew, and you can use any another pictures or own remembrance. 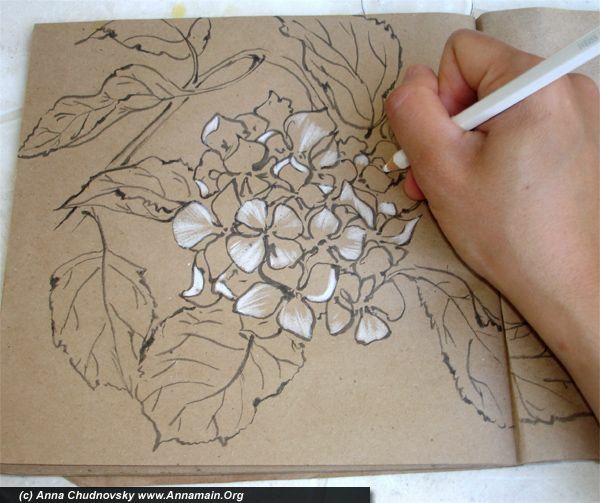 2 - draw by pencil or brush a group of hydrangea flowers you choose with several leafs near it. Try to feel relaxation during the process.. it`s really easy: 4 simple petals per flower. You can also use that picture to copy and than to coloure it. 3 - Paint out by white pencil (or watercolor) the ends of petals as it showed on the picture. 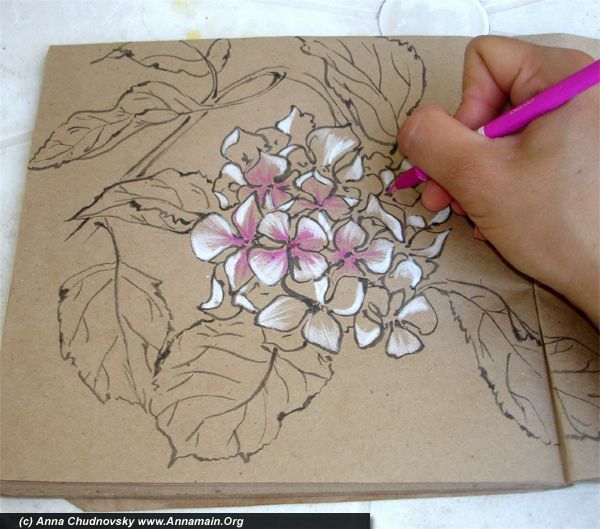 If you draw on white paper use light pink color instead white. 4 - good news! On that picture you can use all colours you like. 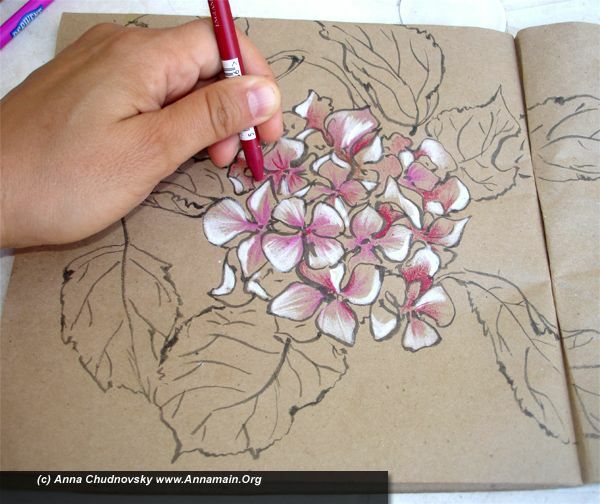 I choose dark-pink to make the centre of petals. Don`t worry about result, just do it. 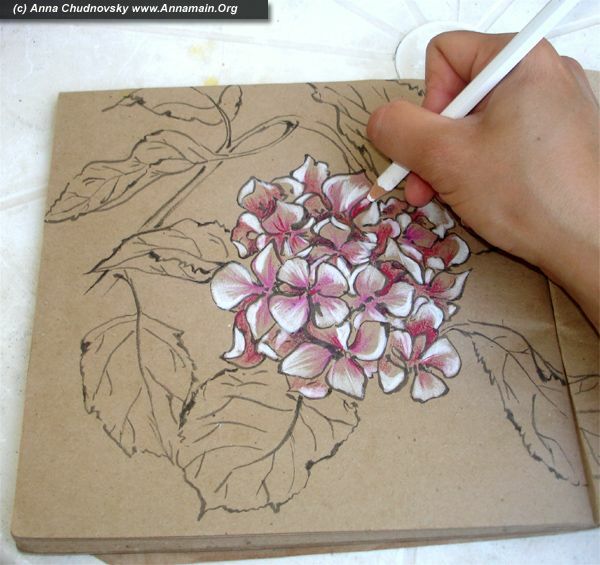 The point is to make strokes on the direction from centre to end of petals. 5 - By dark red color make several petals more lively. Not everyone but several, you can choose it using own intuition. 6 - by violet color make gaps between petals deeper. It`s a mistery how different colors creates the picture you can recognize as natural. So you work with colors is a kind of magic! 7 - by white again make smoother the edge between white ends of petals and another colors. 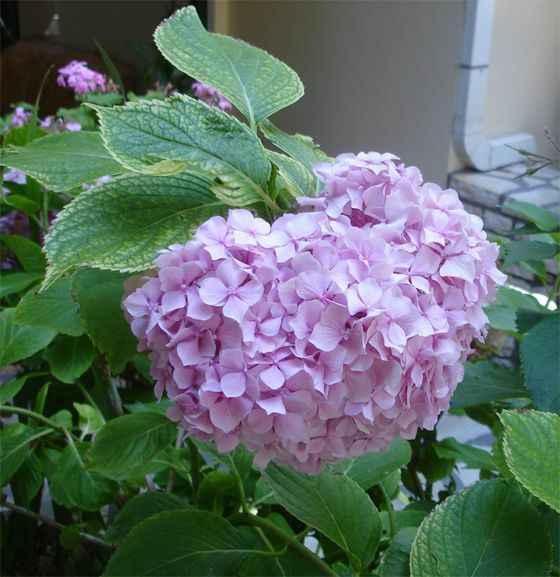 That way you can feel better how to create the volume of hydrangea, do it the way you feel and enjoy the result. Ok! That step is the final for our first part master-slass. Next steps will be later. I would like to help you to feel the deep reason of such therapy and to suport your attempts to use intuitin and creativity. Also you can make it as a kind of meditation using deep breathing and music. 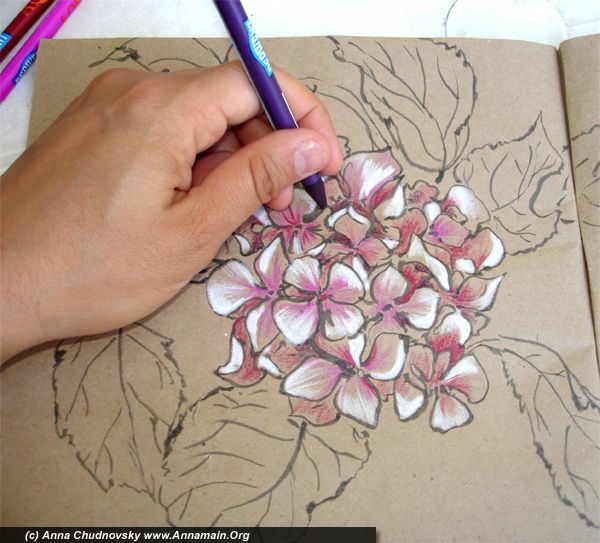 As you do it pay attention on lines and colors only, forget anything else, create a flow of movements… this is the way to remember not only one hydrangea flower, but all flowers you`ve ever seen. Relax… Releaf youself. Let it be. You do give a detail here. I have study a destiny about this on different articles written by other people, merely I must admit that you experience showed your point here! Courteous posting,very advisory.Thank you, very absorbing to read, you should be astonishing of your blog. I was truly relishing to check your subject matters from meter to time. We are depending forward to your potential posts. I love to paint. And I have múltiple sclerosis so I need to fuccus In differents things to stay better. And your ideas are ver helpfully, Thanks for that and God bless you.